Follow your creative bliss toward, peace, love and happiness. Also, if you should have cause for concern with your own health my mantra that I live by is: “When in doubt? Check it check out”. Preventative measure is the key until we find a cure for cancer as a community. I am speaking from experience because I was very lucky to have caught my diagnosis in its initial stages. My social responsibility I feel so strongly about starts with my family first. By sharing my life journey as a survivor is my way of connecting the dots with them so that we may grow and heal from this ordeal. I was the first person in my ohana which means family in Hawaiian, to have been diagnosed with breast cancer and I pray with all my heart and might I will be the last. It is my duty to further educate them about our health and to take away the fear of early detection through the only way I know how through art. Following my creative bliss has led me toward peace love and happiness. These are standards I continue to live my life by and words that I hope will help guide my family in the face of adversity by learning to rise above it like I did with dignity and grace. Do you have any tattoos that relate to your cause? Yes, I have 4 tattoos that are my forms of solidarity with breast cancer. These are my modern day family crest coat of arms so to speak. The 1st one is my most monumental. They are my mastectomy tattoos which are done in the shape of a Hawaiian pink plumeria flower petals on both of my breasts. 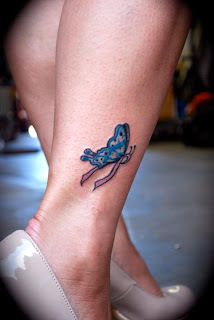 The 2nd, tattoo which is also very symbolic is of my Breast Cancer Pink Ribbon Butterfly tattoo on my right ankle by Scott Glazier. I also have an Aerial Hoop Trapeze on my lower left inner arm by Dan Smith. I support people who has a good cause. Cancer is widespread and people who support organizations that fight cancer is really encouraging.